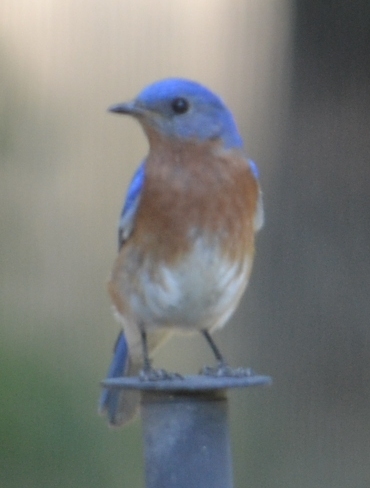 Last week I finally got a chance to do what I have been waiting 3 years to do - take a picture of a bluebird. They are a common bird around our neighborhood and the local park, and I often see them on walks, but they do not visit our backyard very often. This is most likely because of Miikka - he is very territorial towards birds in his yard, so much so that I have had to remove the bird feeder because it drove him crazy. He barks at the robins and jays that are brave enough to visit as much as he does the squirrels. Sigh. 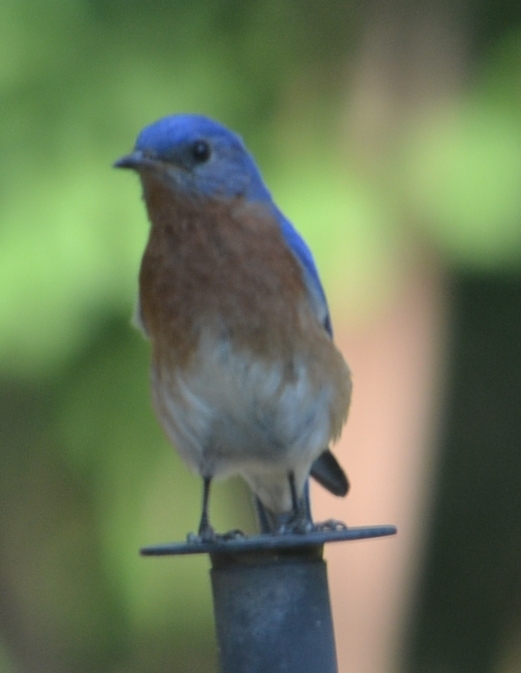 But last week, while Miikka was asleep inside, one lone bluebird came for a quick visit. I almost didn't grab the camera, because I was convinced he would be gone by the time I changed to my telephoto lens. But he didn't fly away, and I was able to get several decent shots through the windows. We didn't have bluebirds in Bellevue when I was growing up, although there is a Western Bluebird species, so until we moved to Arkansas, I had never seen one outside of pictures. 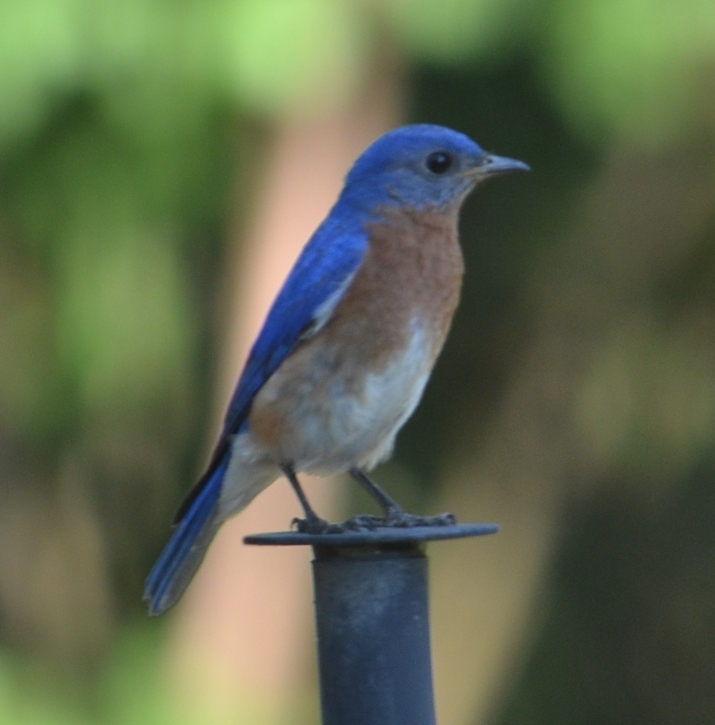 I think they are one of my favorites to spot, and I always give an excited little "bluebird!" cry whenever I see one. Speaking of bluebirds, you should all go out and read The Bluebird Effect: Uncommon Bonds With Common Birds by Julie Zickefoose. She is a naturalist, artist and writer who has a wonderful blog, in addition to this gorgeous book. I requested a copy for my birthday, and then read it like dessert - a little at a time - to make it last longer. The watercolors and drawings are fantastic, and the stories are amazing. A grown-up version of all the animal rescue stories I devoured as a kid. Oh, I am so looking forward to this long weekend. I have very few plans, and we aren't traveling. Benjamin is playing in a tennis tournament, so I am sure I will be spending plenty of time watching him - I'd rather be playing myself, but oh well. Since it is supposed to be middle-of-the-summer hot this weekend, I should probably be grateful I am not playing! This past weekend, we finally bought ourselves some proper adult furniture for the bedroom, to replace the ratty dresser we've had since college and some matching nightstands. (Funny story about that dresser - Benjamin and I each bought one for our respective apartments while we were dating - almost identical, except that one went together better than the other. During one of our moves, we decided to get rid of one. Guess which one we kept - yup, the even crummier one. Oops.) The dresser will now go to the baby's room and get a changing table top put on it. It isn't very good for lots of grown-up clothes, but it can surely handle diapers and onsies for a couple of years. Baby won't know the difference. As much as I have wanted to transition away from college and grad school furniture, it has been hard to do, probably because I am rather a cheapskate. Not about everything - heck, I have a $400 pair of boots in my closet (that I LOVE and wear all the time in the fall and winter), and our food budget is pretty high for two people - but definitely for furniture. I think I just don't like to spend so much money on any one item, especially one that just sits there, like a dresser. But it was time. And since we bought decent pieces, they should last for a very long time, which makes the price worth it. Now we just need to get around to painting the bedroom (and the rest of the house), buy some proper chairs for the kitchen table, and a recliner for Benjamin's study, and we will be truly grown up! My tennis team has been given a place at the state tournament next month. I am happy for our team, but kind of bummed out that I won't be able to play. Even though I knew this was a possibility when the season started, it is still bittersweet. Since I was out of town last year I missed that tournament too; this year, at least I will be here to cheer my teammates on. And maybe bring cupcakes. I'm slowing down these days - not by choice, exactly, but by necessity. At 7 1/2 months pregnant, I just don't have the energy I usually do to get things done. I know this is natural - my body's making a baby here, after all - but I'm not particularly happy about it. I miss playing tennis several days a week, playing until I am drenched in sweat and exhausted physically and mentally. I miss pushing myself to run just a little farther - when I got pregnant, I was working my way towards being able to run a 10K, and while I could technically still be running, lately, I've had to switch to the elliptical for various comfort reasons. I'm still going to the gym 2 or 3 days a week, but only for 30 minutes most times, and I am still walking the dog around our hilly neighborhood, but I've slowed down there too (not entirely my fault, thanks to Miikka the Reluctant Walker). Soon it will be too hot for me to do much of anything outside, so even walking will have to move to the track in the gym (ugh), which may not actually be slower, but will certainly feel slower due to the lack of visual stimulation. This forced downshift in activity just feels so strange. I'm not mentally in control of it - my body is in charge of the process, with no help from me - and that is a bit unsettling for someone who is used to at least having the illusion of control. No matter how much my brain wants to go out and run or play tennis, if my body says no, there isn't much the brain can do about it right now. 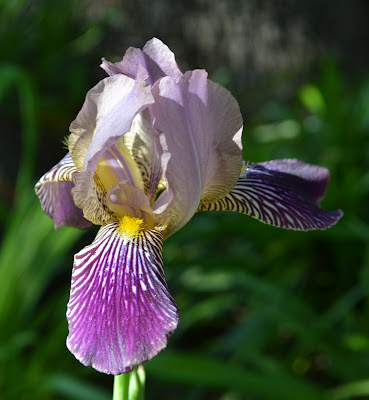 Last year, a friend gave me some iris from her yard, and I planted them in our front flower bed. 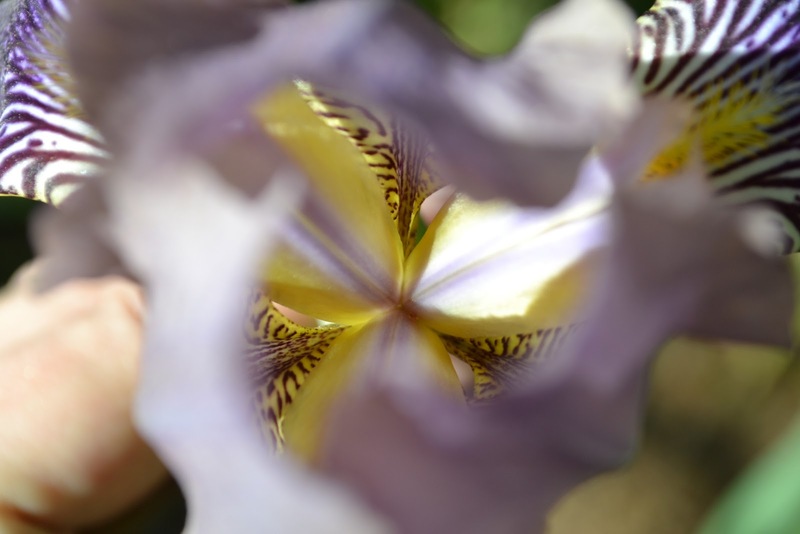 I wasn't expecting to get any flowers this year, but one of the plants surprised me with this beauty. I love the stripes and the creamy yellow interior. My parents have come and gone, and the baby's room is now painted. The crib is assembled too, but that's as far as we got. This weekend, Benjamin and I hope to do some furniture shopping - for a bookcase for that room and a dresser for ours (so we can then put our old grad school dresser in the baby's room), at which point the room will start to look inhabitable. And I do have some decorative things to put up on the walls...eventually. What I am saying is, I don't have any pictures of the room yet. Soon. My parents have arrived to help get the baby's room in order, which means I won't be sitting around staring at a computer all day, which means I won't be blogging either. But! This means there will be pictures of a completed nursery sometime in the nearish future. Or at least of a painted one. So, go watch the Lizzie Bennet Diaries, read a good book, have a nice weekend. The Lizzie Bennet Diaries. They are an ongoing adaptation of Pride and Prejudice, through Lizzie Bennet's video diaries on YouTube. Here is the first one - go watch them all! In case anyone was wondering, yes, I am definitely feeling the baby kick now. For someone the size of a rutabaga (yes, that's how a 26 week fetus was compared on one baby website - and I ask you, how is that at all helpful? Rutabagas come in all shapes and sizes. But I digress, from my digression) he sure knows how to kick. If he continues to be this active after birth, we are going to have our hands full.